On September 26, 1928 Gonxha Agnes Bojaxhiu, then 18 years old, left her home in Skopje to join the Institute of the Blessed Virgin Mary in Ireland. On September 5, 1997 Gonxha died at 9:30 p.m. in Calcutta. But by that time Gonxha was known to the world as Mother Teresa. This incident and others pushed Sister Teresa to begin her work among the poor in Calcutta. During the time of her calling she described her experiences with Jesus as "so much union." (2) Her mystical experiences of union with Christ were experienced as "love," " trust," "sweetness," and "consolation." (2) On December 21, 1948 Mother Teresa entered the slums of Calcutta as a Missionary of Charity for the first time. Through so much effort, petitioning, and preparation she had finally fulfilled the call of God. She had obeyed the Voice of Jesus. But suddenly, mysteriously, and painfully, that Voice now went silent. In recent years, as Mother Teresa moves through the process considering her for sainthood, various aspects of her ministry and spiritual life have been brought into the public sphere. Recently, many of the private letters of Mother Teresa have been published in the book Mother Teresa: Come Be My Light. Many of these letters were shocking in that they revealed the dark spiritual journey Mother Teresa walked for so many years. As noted above, prior to the beginning of the Calcutta work Mother Teresa's mystical encounters with Christ were vibrant, powerful, and intimate. But God seemed to abandon her just as the ministry started. For the next 40 years Mother Teresa's experience with the Divine was characterized by a profound sense of God's absence. Both the depth and length of her "dark night of the soul" was startling to those who only knew her public face of faith. In July of 1948, the year Mother Teresa began her ministry in Calcutta, Charles Schulz was baptized in Phalen Lake in St. Paul, Minnesotta. It is a part of the human condition to feel abandoned by God. This is not a recent, modern phenomenon. It is not a product of science, secularism, or modernity. From the very beginning of the story of God the experience of the absence of God has been a ubiquitous feature of the faith experience. The Old Testament witness is filled with the voices of those who have felt abandoned by God or of those who sought God in times of trouble only to be met with a profound silence. Feeling rebuffed, the experience of lament emerges where "disappointment with God" is voiced. Even the Messiah called out "My God, my God, why have you forsaken me?" 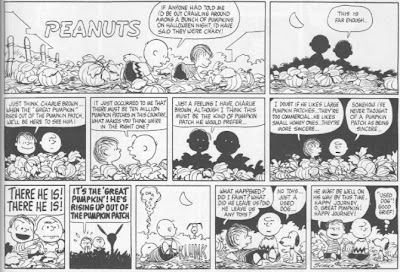 If there is an autobiography running through Peanuts we might speculate that Schulz himself experienced a continued or reoccurring "dark night of the soul." 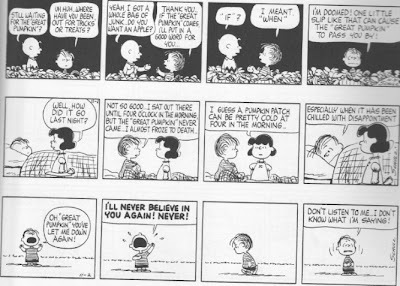 Evidence for this inference comes from Schulz's repeated depiction of the disillusionment and pain associated with disappointed faith. A recurring motif in Peanuts is a depiction of the absence of God. But all these efforts are for naught. Linus' faith is crushed again and again. The Great Pumpkin never comes. Sometimes that is what it feels like to be in relationship with God. Sitting in a pumpkin patch. Alone. While people think you are crazy. And wondering the next morning if they might be right. When I read of Mother Theresa's "dark night of the soul," a few months ago, I was ambivalent. On one hand, I found her story all the more powerful given that she followed God so steadfastly despite such doubt. 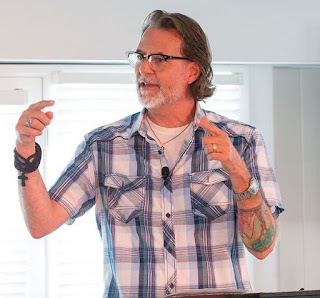 On the other hand, I thought, "Well, if God didn't make His presence known overtly to her (of course, there's her vision of Jesus story that spurred her ministry), then what on earth can the rest of us expect?" "It is not that God's help and presence must still be proved in our life; rather God's presence and help have been demonstrated for us in the life of Jesus Christ. It is in fact more important for us to know what God did to Israel, in God's son Jesus Christ, than to discover what God intends for us today. The fact that Jesus Christ died is more important than the fact that I will die. And the fact that Jesus Christ was raised from the dead is the sole ground of my hope that I, too, will be raised on the day of judgment. Our salvation is 'from outside ourselves.' I find salvation not in my life story, but only in the story of Jesus Christ. Only those who allow themselves to be found in Jesus Christ--in the incarnation, cross, and resurrection--are with God and God with them." The skeptic in me thinks, "Ah, Diedrich, you're just letting God off the hook for the times he seems so absent." But when I consider Bonhoeffer's plight--a suffering which I'll likely never know--I think he understood so much more deeply than I the significance of Christ. I think this is a profound post on the tension that many Christians (or believers of all stripes in many different belief systems) bump up against. In fact, this weekend I had two separate conversation with a group of friends on what it means to be spiritually mature. I mentioned how we tend to throw around that or other related terms without much clarity on what they mean. So we pushed back a bit... what does spiritual maturity entail? is it lack of doubt? is it commitment? is it confidence in creedal statements? is it action such as kindness or love? In talking through this issue, I realized that, in many ways, the metrics that I use towards other people fall carelessly short in addressing the complexity of the life of faith. In holding those metrics up to myself (faith/ lack of doubt/ confidence in creedal statements) I personally fall dreadfully short. More often then not I sympathize with Mother Teresa, Charles Shultz and Linus' dark nights of the soul more than the certainty these metrics entail. I think it brings up the question of what we mean by faith... and how belief and unbelief can often exist inside the same person, as profoundly expressed by C. Taylor in A Secular Age? Similarly, given these tensions (that some people feel), how is it possible to exist without extreme cognitive dissonance in communities of belief when these competing feelings are often seen as the dividing line between the in- and out-group? "How is it possible to exist without extreme cognitive dissonance in communities of belief when these competing feelings are often seen as the dividing line between the in- and out-group?" Good question, Peter. Richard has suggested before--and I tend to agree with him--that orthopraxy trumps orthodoxy. I believe faith certainly entails a component of trust, but I think that a display of commitment through action--perhaps even more so in times of doubt--constitutes a more mature faith than a lack of doubt paired with a tepid commitment. I feel the cognitive dissonance of which you speak most profoundly during Sunday morning worship. "Praise"-centered worship perturbs me sometimes. First, many of the songs are decidedly vapid, with the praise limited to what God does for me individually. Second, such worship doesn't speak to the complexity of human experience or the spiritual/emotional states people find themselves in in a given week. In other words, "church" is defined as a time for ostensibly happy, undoubting folks to get together and sing about how happy and faithful they are. I'm not really sure how to mitigate the cognitive dissonance in a corporate worship setting. Singing less vacuous songs would be a start, I suppose, but even then I think it's difficult for people to be transparent about doubts and frustrations in a large group. I like the idea of lament services, but I doubt any church is going to make that a weekly (or even monthly) component of Sunday worship. I've found that small groups, community groups, or whatever you'd like to dub them are more conducive to spiritual transparency. They aren't perfect, of course. To borrow Richard's terminology, if a "winter Christian" is in a group of "summer Christians" or vice versa, then the dissonance will still exist. But at least in a small setting everyone has a voice. I found your blog through Discombobula and have enjoyed reading for a few weeks. "...I don't think God wants to be worshipped. I think the only pure worship of God is by loving one another, and I think all other forms of worship become a substitute for the love that we should show one another." That's wonderful. I think there come a point where we realize God was never after worship. It is due to our twisted sense of guilt which leads us to the need to bow before something in order to get our own impulses under control, even if that means conforming to the impulses of another flawed human. I feel the cognitive dissonance of which you speak most profoundly during Sunday morning worship. "Praise"-centered worship perturbs me sometimes. First, many of the songs are decidedly vapid, with the praise limited to what God does for me individually. We people seem to want those mountain top experiences on a regular basis instead of finding God in the whisper. Oswald Chambers in My Utmost For His Highest, "you will find that He has trusted you in the most intimate way possible—with absolute silence, not a silence of despair, but one of pleasure, because He saw that you could withstand an even bigger revelation." Hudson Taylor also had an experience where he and his wife were reunited after a year apart and as they sat in the car they didn't say a word to one another...they just sat together. Hudson understood at that point what God meant when He said He "would be silent in my love" (Zephaniah??) There is this point, where the walk with God becomes a constant bath of His presence which is not dependent on feelings but upon a deepening understanding of being comfortable together. Sorry to be vague...that link is actually from a book which quotes the interview at the end. Another marvelous post that cuts right to the heart of Faith - within the limits of my understanding. Thomas Aquinas became St. Thomas after creating a marvelous and intricate set of arguments for the existence of God using Aristotle's logic as it came to him thru a Muslim an Arab and a seducer. In this last weeks he was traveling to Rome when he was taken ill - and part of the story is that he realized at the end that all his proofs were as nothing w/ bedrock Faith for that which cannot be proven. At which point he is reputed to have surrendered his life in a despair similar to Theresa's. At the end of the day is this not the story of Job as well - before it's priestly scribes gave up and prettified it with "he lived happily thereafter" ? Are you acquainted with the book The Gospel According to Peanuts by Robert L. Short? I don't agree with all his views, but there are some good (and entertaining) insights there. Wow, what wonderful quote. I just received Bethage's monumental biography of DB. I've read the Cost of Discipleship but nothing else. I'm looking forward to reading all of DB's stuff in the coming months and years. I'd add my agreement to Jason's response. One thing I wonder about if those metrics fail because of the focus on the individual. What if the issue of maturity is best sought for at the communal level? There is a part of me that hates this move, the "communal" move is THE theological move to make these days. But the move has a lot of good theology and praxis behind it. Thus, perhaps a person of doubt, a Winter Christian, brings something to the communal setting that more convicted, Summer Christians cannot bring. If so, the "maturity metric" might simply be the willingness to "stick with" the hard work of Christian community. Just a thought. Thanks for the link and the comment. I resonate with your comments about worship. 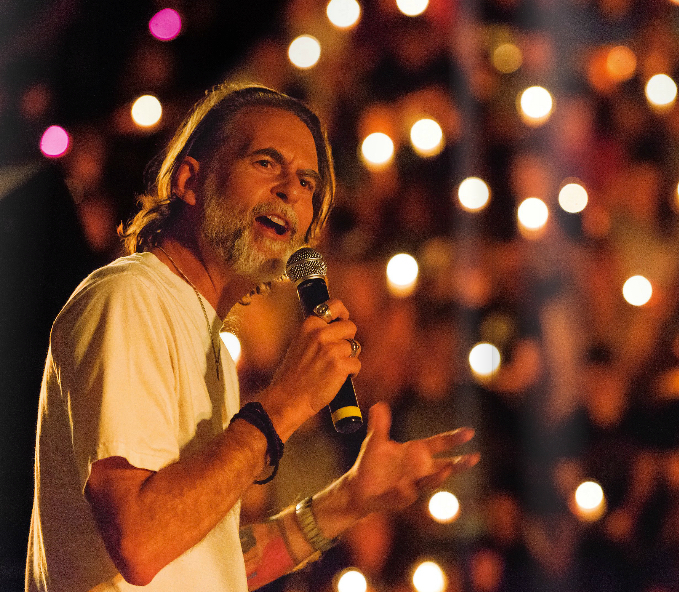 I've always wondered about the view of God sitting behind praise-dominated worship. Thank goodness for the book of Job. Regarding the addendum, I've heard that Job 42.11 ("...and comforted him for all the evil the Lord had brought upon him..."), the textual admission that God did do evil to Job, combined with God's doubling up in restoring things to Job, is a clear Semitic sign that God was in the wrong and was justly indicted by Job. Basically, despite God's powerful display to Job, Job wins the argument. Which is how I like to see it. However, Short's analysis and mine do touch in places. Sorry to get in toward the end. I have a question: "Would Linus' theology of the afterlife be 'Pumpkin Pie in the Sky Bye and Bye'? I have nothing to add to this great post and great comments except lots of nodding, and lots of food for thought to take away. Good stuff. Because so much of what she says sounds, to me, like it comes from deep depression (clinical depression). I'm not trying to psychologize here; if anything, I've been very surprised at how even "secular" articles on her letters seem to avoid mentioning that she might have been wrestling with mental health problems. Perhaps it has to do with the way she has been so idealized in the media and in popular (as well as church) culture? Somehow the idea of living in such a dark place for so very long doesn't strike me as something that God would wish on anyone - though obviously, that's my personal sense of it. I haven't been able to read all of the published letters, if only because of the profound despair expressed in them, which - in my opinion - goes far beyond the boundaries of your "Summer/Winter Christian" thesis (as I understand it).